Thank you JORD Watches for sponsoring this post. I received a complimentary product to review. This post may contain affiliate links. As always, all opinions are my own. Currently, counting down the weeks until spring when I can brighten up my looks — I’m really into incorporating timepieces like JORD watches with my stylized look. I can’t be the only one that is excited about spring and all the looks it will bring?! And, warm weather. I can’t wait until the weather is warm again and I see blue skies instead of gray skies. There’s just something about spring and a season of blooming. 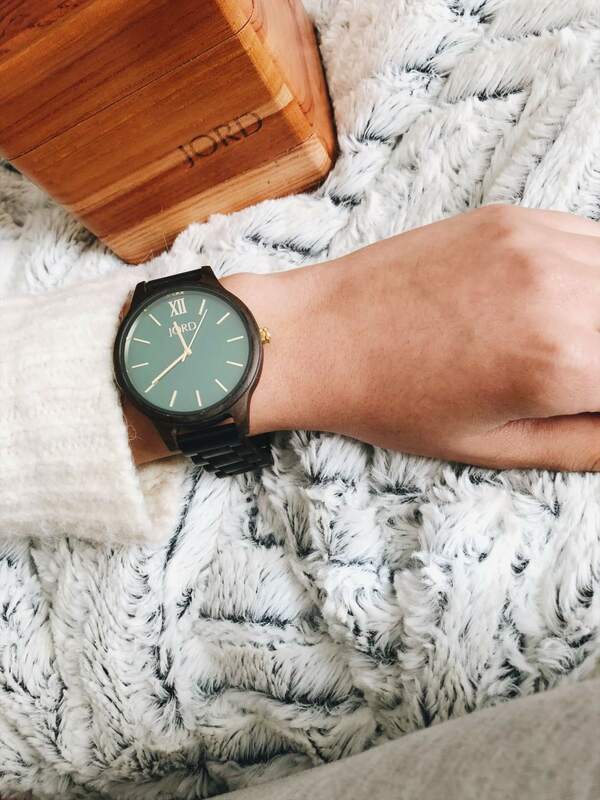 As we head into the spring season, let’s focus on my obsession right now: JORD Watches. 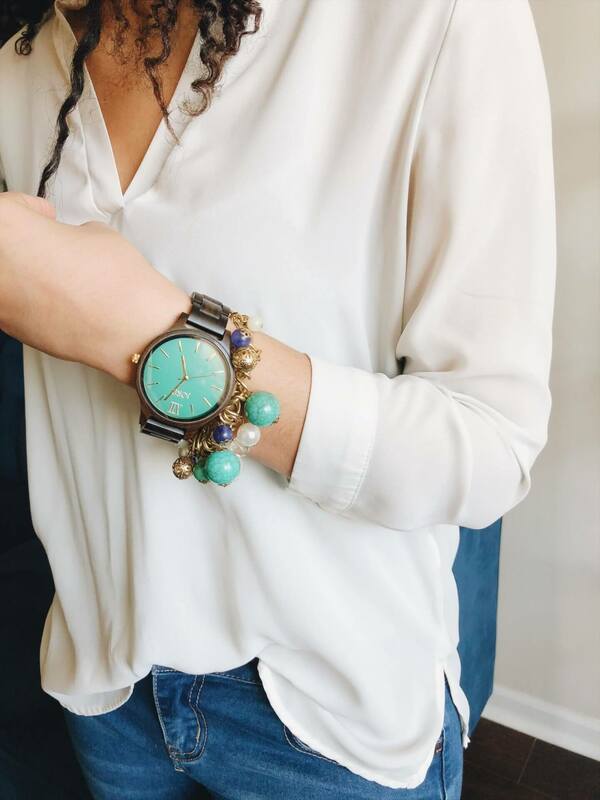 These watches are beautiful wooden pieces that have a classic look to them. 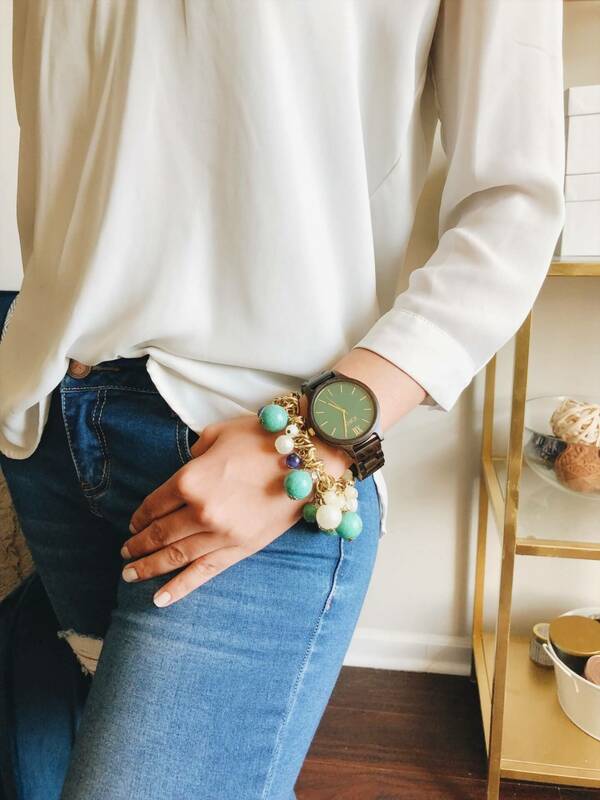 There is a variety of JORD watches and I was able to partner with them and receive a Dark Sandalwood and Emerald from the JORD Frankie series. You might have seen JORD watches on Instagram. I know I had seen the wood watches on Instagram and I was interested in the watches because they’re gorgeous. Each watch looks different — there might be a similarity but the faces are different and they all have their own uniqueness about them. I’m pretty sure you can see why I love the Frankie.The beautiful woodwork and emerald face stand out. The gold on the emerald face stands out and the face is simple without being overrun by numbers. I love that I can pair my JORD watch with all of my outfits whether it’s for work or a chill day. 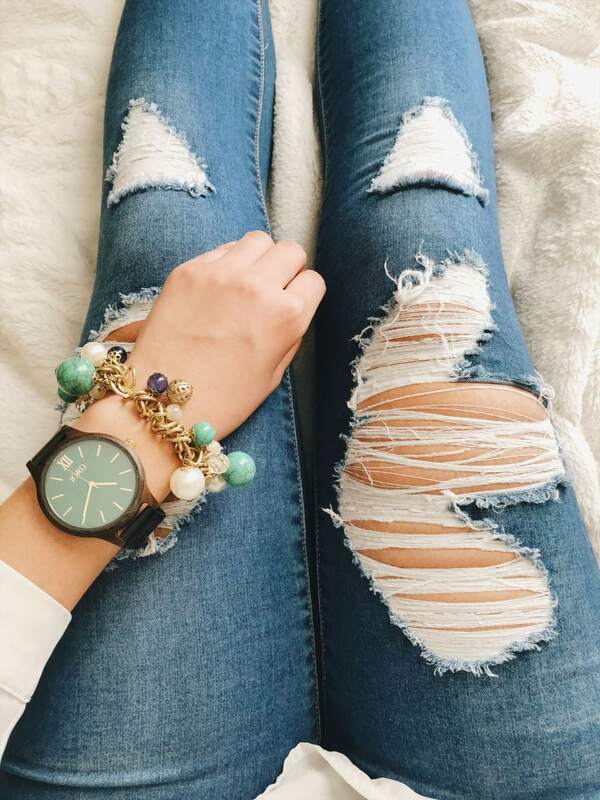 I can play up a comfy look with my watch and I can add classy to my simple work attire. The great thing about JORD watches is that there are different series so you don’t have to indulge in the Frankie. You can look into the other series like the Cassia or Cora. You have multiple choices that you can choose from. My favorite thing about my watch is that it makes me feel classy and it’s crafted to reflect each perosn’s style and preference. 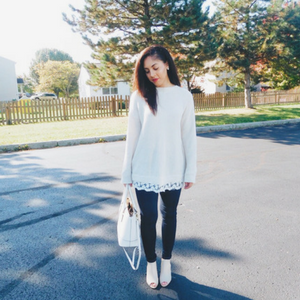 I love that I can wear it with anything but I know it’ll go great with all the dresses I plan to wear this spring. I love that it’s a wooden watch and that it’s not easy to scratch up. Plus, you can find a piece for everyone in your life! Lucky for all of you, I have paired up with JORD watches to give one lucky winner $100 off of a JORD Watch of your choice. What a deal! Basically, you’re getting the watch for almost fifty percent off! That’s such a good deal and why would you want to pass up on this chance? If you’re interested in the giveaway, you can enter here. May luck be in your corner as you enter. And if you don’t win, no biggie — everyone will receive 10% off when the contest is over. So, everyone is a partial winner in some way. The giveaway is open until March 25, 2018, at 11:59 pm CST so enter now! If you can’t wait until 3/25/2018 to get your JORD watch then feel free to take a peek for yourself and buy your favorite! Next Post And, a baby makes three!